Our mission is to pursue excellence in research, education and outreach in the fields of Earth, environmental, energy, and planetary sciences. 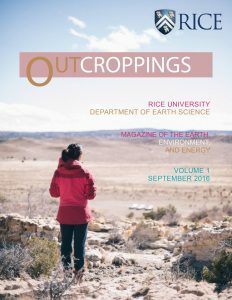 The Department of Earth, Environmental and Planetary Sciences at Rice was founded in 1952 with only three faculty as a result of a generous endowment from Mrs. Olga Wiess as a memorial to her husband. Since then our department has grown to 18 full time faculty. We currently have approximately 50 PhD and MSc students and 20 undergraduates. Over 1100 undergraduate and graduate students have graduated with degrees from our department. Our faculty are internationally known experts in their fields. Many have received prestigious junior, mid-career and senior awards in research as well as public service. We conduct both academic and applied research, but the common thread that binds us together is the belief that real progress is driven by fundamental research. We have one of the strongest programs in the country in deep Earth sciences, environmental science, and surface processes. We investigate volcanic eruptions, the structure and dynamics of planetary interiors, global geochemical cycles, present and past climates, the rise and fall of mountains, the dynamics of rivers and sediment transport, atmospheric processes, the origin of ore deposits, earthquakes and much more. We are also strong in many aspects of exploration geology and geophysics and have close ties with the energy industry in Houston and beyond. Many of us also apply our knowledge to environmental sustainability and other societal problems. We are proud that our faculty, while experts in their fields, are highly versatile. 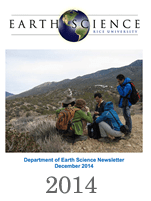 This has allowed us to adapt and consistently lead in the rapidly evolving fields of Earth sciences. Because of our versatility, we have developed a collaborative and synergistic culture in the department, which has fostered a number of seminars, new research directions and proposals among the faculty as well as the students. 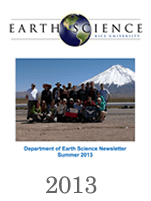 We are one of the leaders in interdisciplinary studies, particularly in linking deep and surface Earth processes. Key to our success has been our aggressive and careful faculty recruiting efforts, focusing on creativity and potential for future success rather than trying to fill or replace traditional niches. We have a strong track record of identifying and hiring junior talent, and then nurturing them to become scientific leaders. Over the years, our faculty have come together to establish cutting edge computational and analytical facilities. We have the Center for Computational Geophysics, which plays a key role in managing Rice’s Chevron Visualization Center. We have a consortium of instruments for characterizing the elemental and isotopic composition of almost all Earth and environmental materials, from the nanoscale to the centimeter scale, from solids to liquids to gases. These facilities include four state of the art mass spectrometers, a field emission electron probe micro-analyzer, a micro-XRF mapper and more. In our experimental labs, we have unique facilities for simulating the extreme conditions of the Earth’s deep interior or the dynamics of volcanic processes. We also have apparatus for measuring the rheologic, mechanical, elastic and electrical properties of geologic fluids and sediments. We believe that good research, good teaching and good mentoring are intimately connected. We operate a strong externally funded graduate research program and a successful undergraduate education program. Our PhD students have gone on to positions in academia, industry, consulting, and public policy. We have a high faculty to undergraduate student ratio (approximately 1:1 for undergraduates). This, combined with talented Rice undergrads, has also allowed us to engage undergrads in research, often leading to undergrad publications. Many of our undergrads go onto graduate school and those that do not have built successful careers in industry. Some of our undergrads have gone on to medical school. An integral component of our program is the large number of field trips associated with our courses, funded by a generous endowment. These field trips provide opportunities for students to take what they learn from class and apply them to the real world. Our field trips for education and research have taken us all across our planet, to every continent. We have regular trips to California, New Mexico, Washington, west Texas and our own backyard, the Gulf Coast. Every other year, our type locale field trips take us to more exotic places, such as Turkey, Cuba, Hawaii, Chile, the Swiss Alps, southern Spain, and the Canadian Rockies. In terms of research, we have gone to China, Antarctica, Papua New Guinea, remote islands in the Pacific and Indian Oceans, and eastern Siberia, to name a few. Finally, we believe that our strength comes from not just our current students, faculty and staff, but from all of our alums and past faculty and staff, who built the legacy on which we continue to strengthen. You can read about our experiences on our blog. This is an exciting time for us. Please come visit or, better yet, join us!